If you caught the end of Game 1 of the NBA Finals on Thursday night, then you got to witness one of the most glaring errors to ever occur in televised sports. J.R. Smith cost the Cavaliers the game making the baffling decision to dribble the ball away from the hoop -- with a tied score and seconds left on the clock -- rather than shoot what could have been a winning shot. Reactions to Smith's epic gaffe were swift from announcers and fans alike, but none were more iconic than the one from his teammate LeBron James on the court, whose outstretched arms and "why in the hell are you doing that?" facial expression became a meme-worthy moment for the ages. 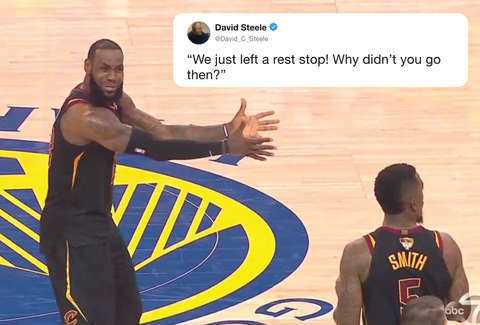 In fact, LeBron's perfect embodiment of frustration and disappointment seems to have already entered the meme hall of fame, as Twitter users work overtime to turn out some truly wonderful riff's on his universally understandable reaction. The Cavs may have lost this time around, but the Internet definitely won. Some have managed to take it to a whole other level by bringing other memes into the mix. Thank you LeBron for this wonderful gift.